Distributors move the physical records from record labels to wholesalers and retailers. In South Africa, for a long time, the major companies used to dominate the record distribution sector and the independent labels used their distribution services. When distributed by majors, small labels are, however, typically concerned about their products’ visibility because they believe the sales representatives foreground the majors’ own products. In addition, with relatively little competition, the distribution fees tend to be rather high. These concerns led to the rise of several independent distribution networks in South Africa in the 1990s and 2000s. 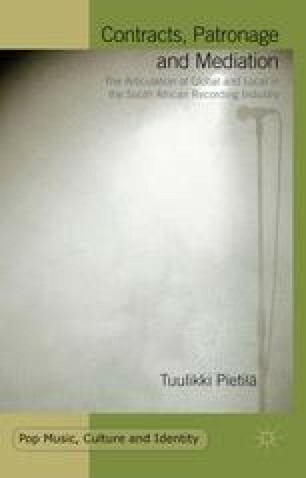 Among these were Cool Spot Distribution (which operated until 2012 and was connected to the label Cool Spot Productions), Independent Music Distributors (IMD; connected to the Bula record label), Soul Candi Distribution (later Mesh), and Independent Record Industry Solutions (IRIS; related to the Sheer Group)1 — all based in Johannesburg. In Durban, Revolver Records is an important independent distributor. Select Music Distribution is a central distributor of Afrikaans music. Cool Spot Distribution and Soul Candi Distribution used to be truly independent in that they had their own warehouses2, as did IMD have as well (until Bula Music was acquired by Gallo Record Company in 2014). In contrast, IRIS and Mesh use the warehousing and distribution logistics facility of Entertainment Logistics Services (ELS).